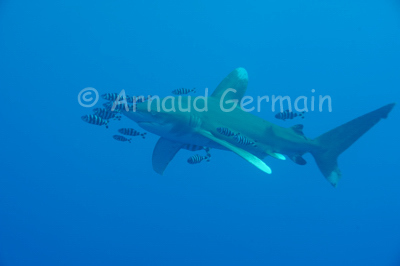 arnaud germain wildlife photography: Oceanic whitetip shark in the blue. Oceanic whitetip shark in the blue. One of my favourite pictures of this ocean-going creature. They are seen relatively frequently for a few months off the South plateau of Elphinstone Reef, in the Southern Red Sea. They cruise just under the surface in the blue. Diving with them requires good skills as you almost always finish the dive in the blue, with no reef or bottom to orientate you. And they appear and disappear like ghosts in the ocean. This one was escorted by his entourage of pilot fish who ride the bow wave created by the shark. L'une de mes photos préférées de ce vagabond des mers. Ces requins sont vus relativement souvent pendant quelques mois, au bord du plateau sud du récif d’Elphinstone, dans le sud de la Mer Rouge. Ils patrouillent juste sous la surface, dans le bleu. Plonger avec eux demande pas mal d’expériencecar la plongée se termine Presque invariablement dans le bleu, sans récif ni fond pour s’orienter. Et ils apparaissent et disparaissent comme des fantômes dans l’océan. Nikon D700, Nikon 28-105mm macro at 78 mm, F8, 1/60th, ISO 200, Ikelite housing, Ikelite DS160 set on TTL.